Is it possible to travel back in the past and live those wonderful moments that we really loved in our life? I really wish that was possible then I would have traveled back to my childhood and lived all those most cherishable moments of my life with my parents and siblings. I will even take Mr. V on that tour. That will be amazing actually. So does anybody own a time machine that I can borrow?? No, really? I am not kidding. Sometimes time flies so fast that you do not just realize it. I was like celebrating New Year’s eve yesterday and not it is already September, where did the time go?? It’s funny how we always appreciate the value of things ones they are gone, isn’t it? When I was a kid, I had all the time in the world for myself but I wanted to grow up so I can have all the freedom and now when I am all grown up surrounded by responsibilities, I feel like it really is not an easy job being an adult. Now when I look at parents and I wonder, how did they do it? And that too with four kids?? Bravo to them!! Well, but life goes on and so I have to. But the one thing I can do to keep those memories alive is to recreate it and live them again. Or at least try too. Like this soup. I never thought that this will be a memory to remember when I grow up and it will actually make me feel homesick. So basically this soup was my all time alternate favorite to mango juice in summer. Every summer when our house was flooded with mangoes and when the mangoes were not ripe enough to eat (which was the case many times), mom used to make this. Indian summer is really hard to bear and so you have to stay hydrated. 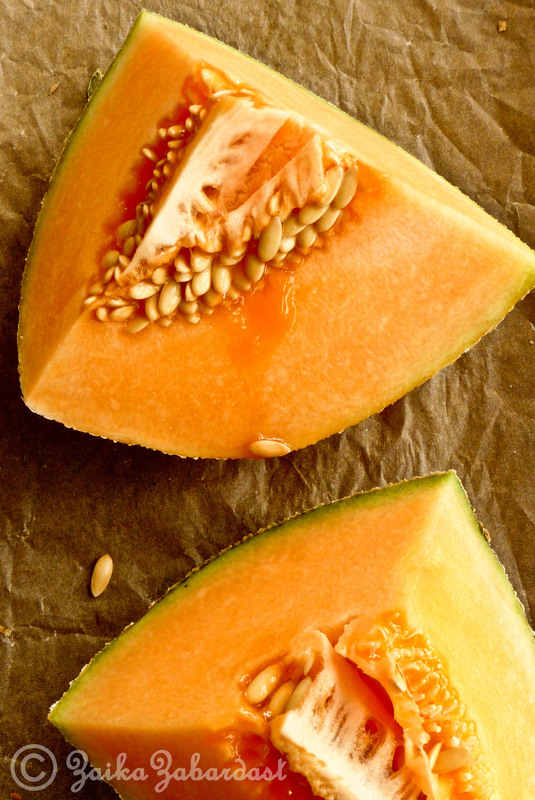 Cantaloupe is full of water and it keeps you hydrated. Finely grated sweet cantaloupe flavored with cardamom and served chilled along with freshly made hot rumali wheat roti dipped in ghee! Yummm! It is purely a bliss. That is how my mom serves it and I love it and it became a memory of lifetime. Now I make it for Mr. V and he loves it too! See this way I am living that memory by thinking of my mom and her kitchen and her genius way of keeping us hydrated etc…etc… Absolutely adore her! You can’t call me a foodie if I do not tweak a recipe and give it another dimension, right? 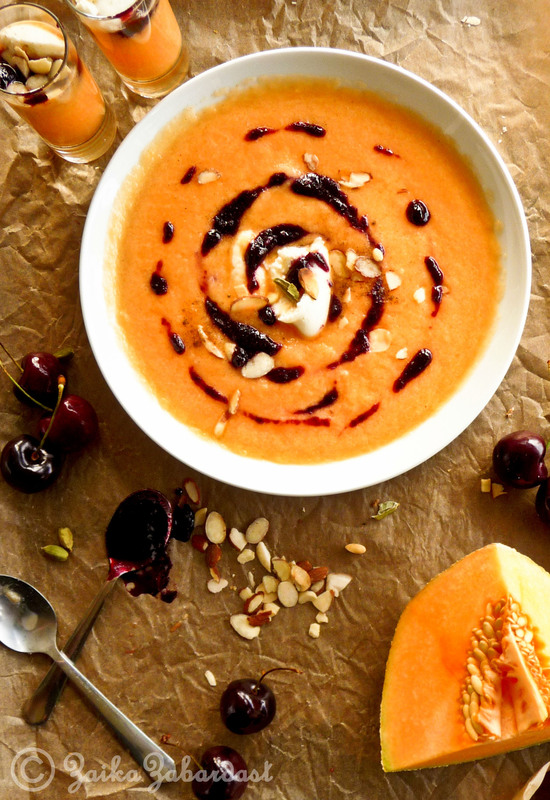 So here is my version of cantaloupe soup with cardamom infused cherry syrup served with a dollop of ricotta cheese and roasted almond slices. 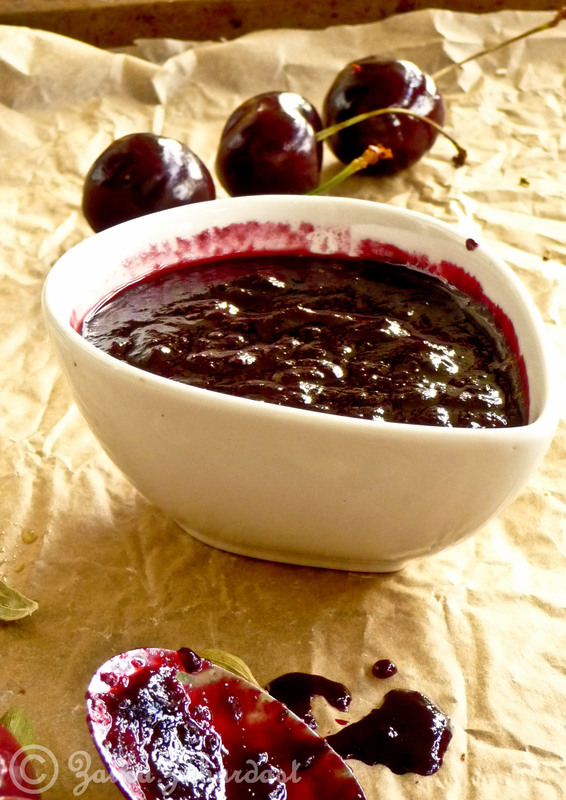 A healthy alternate to regular dessert! Make it while the melon is still in the season. Wash and cut the cantaloupe. Using a spoon remove the seeds and chop the cantaloupe. Puree in food processor. Remove it in a big bowl and add lemon juice, sugar and cardamom powder. Mix well and let it chill. 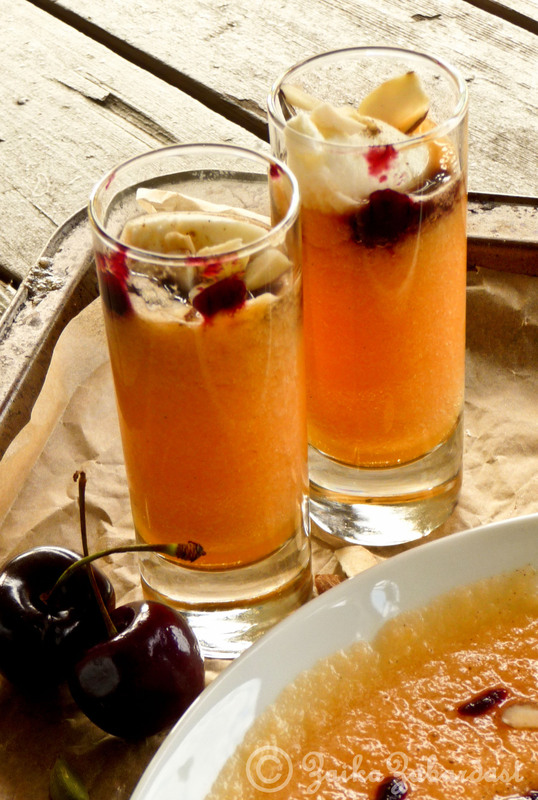 In culinary arts, Compote is a recipe of any fruit cooked in some type of syrup. Normally you get to eat the big chunks of fruits but here I have pureed the compote to change the texture that goes with my soup. But it is totally optional. This can be made ahead and store in refrigerator for a week or so. 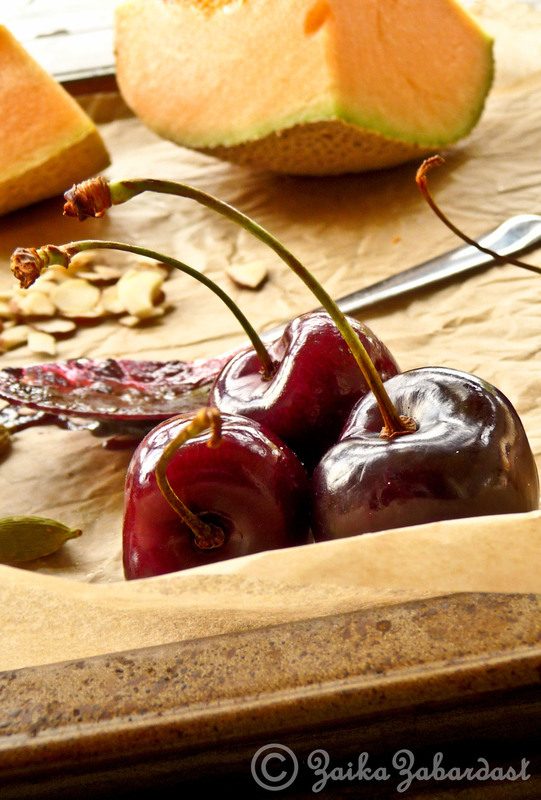 In a saucepan, add all the ingredients and cook on medium heat for about 10 minutes or cherries are soft, cooked. Let it cool down and either serve like that or purée in food processor. Store in refrigerator for a week or so. Use as required. Serve a ladle full of soup in a soup bowl. Top with a spoon full of cherry syrup along with a dollop of fresh ricotta cheese and some roasted sliced almonds. Enjoy! Question: It’s a long Labor day weekend, how are you all celebrating it? We will be celebrating it with our friends and also celebrating Mr.V’s birthday! It is going to be busy weekend! Have a happy Long weekend! ← Peanut Pepper stir fry! 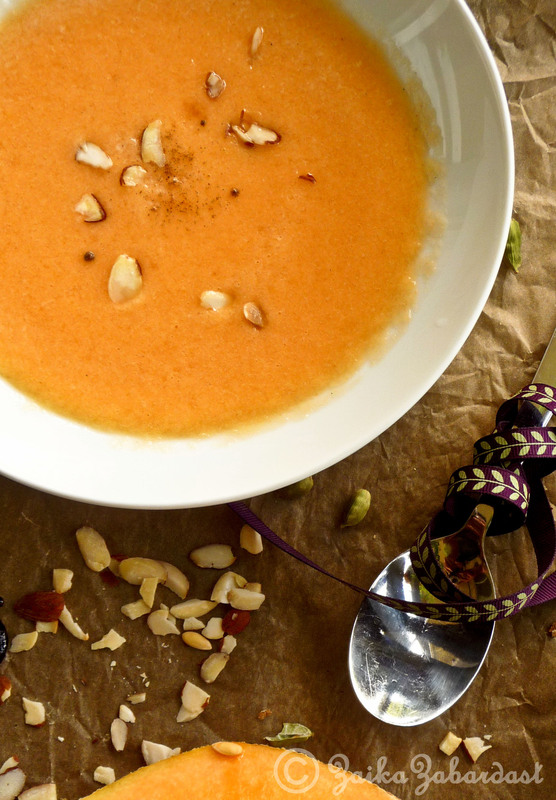 Beautiful, lovely and fabulous soup and perfect for our warm summer days. Perfecto. My mouth is watering! The colors in your photographs are absolutely stunning!